Rio de Janeiro’s terminal proposal is placed in the old port waterfront and is conceived as an horizontal-vertical skyscraper. The tower will become an icon within the city as it is situated along the main entry points of Rio de Janeiro along the elevated highway which is the main entrance to the city . As a new port facility it will transform the experience of cruiseship arrivals. The project is an urban landscape, generated by the flow forces that link diverse infrastructures and urban spaces in the city. 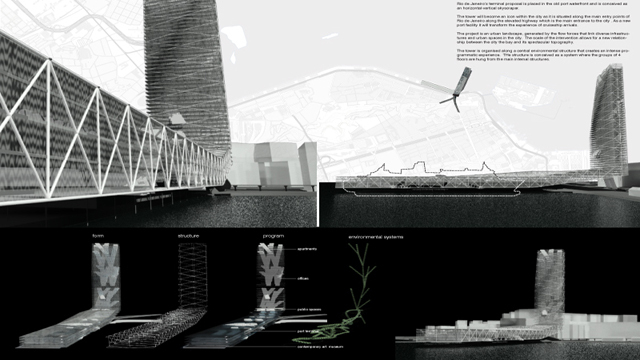 The scale of the intervention allows for a new relationship between the city the bay and its spectacular topography. The tower is organised along a central environmental structure that creates an intense programmatic experience. The structure is conceived as a system where the groups of 4 floors are hung from the main internal structures.